I still have quite a lot growing out in my garden right now, including lots of parsley so this recipe seemed like a good one to make use of some of the parsley. I’m sure the parsley would be better in the summer, but it was still good in this recipe. 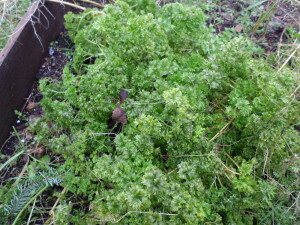 Parsley (Petroselenum crispum) is a biennial plant. It usually grows 8-12 inches tall in zones 5-9. It is a very attractive plant, easily grown in beds, containers and borders. Parsley is really high in nutrients, particularly Vitamin K, Vitamin C and Vitamin A. It is especially high in Vitamin K, which is strongly tied to heart health and healthy bones. The following recipe makes use of pomegranate seeds. Pomegranate seeds are also highly nutritious being high in dietary fibre, folate, Vitamin C and Vitamin K and lots of anti-oxidants. This recipe is from Slimming Meals that Heal by Julie Daniluk. In a saucepan, bring quinoa and water to a boil. Lower hear and simmer for 20 minutes. Let cool. Meanwhile, seed pomegranate and chop herbs, pecans and tomatoes (if using). 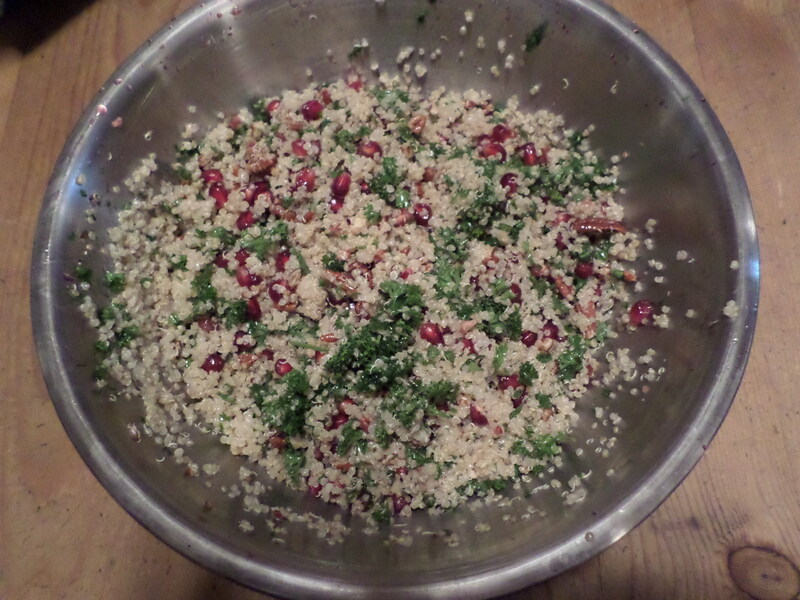 Once quinoa is cooled, combine all ingredients in a medium bowl and mix well. Serve immediately or cover and refrigerate for up to 3 days. This is really delicious and makes enough that you can have some for several meals. 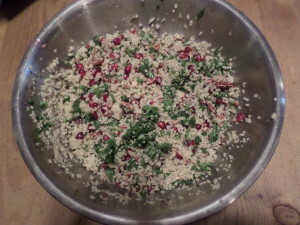 I’m going to try this – I’ve been looking for some new and interesting ways to use quinoa. Unfortunately, I’ll not be able to get fresh herbs from the garden but we can “settle” for the grocery store. Let me know how you like it Kristal.